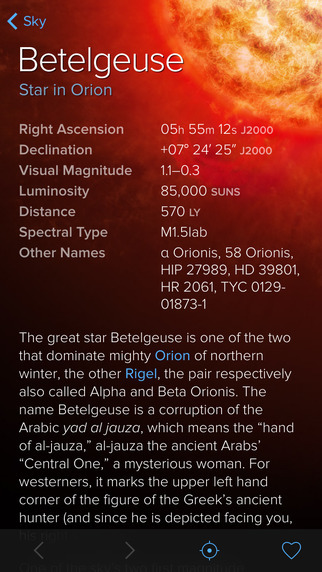 A star and constellation guide has never been more beautiful and easy to use. Just hold it to the sky to automatically find stars, constellations, planets, satellites and more. Its stargazing fun for all ages and experience levels! Is it a star or Saturn? Learning whats in your night sky is now effortless with Sky Guide. Hold your iPhone or iPad up and Sky Guide automatically aligns itself to the stars above youno setup required! Whether youre looking for the constellation Virgo, the Andromeda Galaxy or Mars, Sky Guide will satisfy your curiosity. You can search for thousands of celestial sights and be guided exactly where to see them in the sky above you. Just follow the arrow. Want to watch a satellite pass overhead? 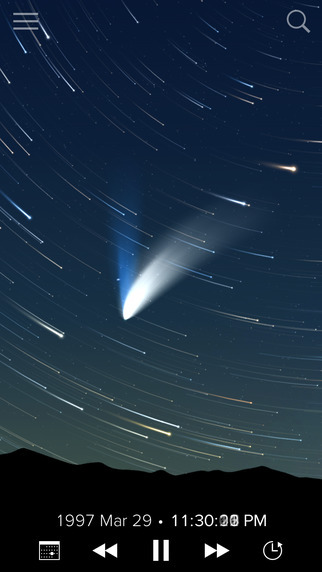 Sky Guide features hundreds of visible satellites for you to identify and track. You can also schedule reminders or get notifications of when the International Space Station is due to fly over even on your Apple Watch! Sky Guide contains immersive visuals unlike any star app you have seen before. With exclusive imagery adapted from high-resolution photographs, youll see millions of stars and feel as though you're spacewalking! Or, if you're feeling more earthbound, gesture down the intensity of star light to match an urban view. Sky Guide may have few buttons but it has ample content. With richly illustrated and cross-linked articlesmany by leading astronomical authorscountless enlightened moments await novice and seasoned stargazers alike. Apple Watch support: See a calendar of upcoming astronomical events the full moon, meteor showers, eclipses, and more. Sky Guide can send you a notification when an event is about to happen in the skies above your location. And it will even alert you when the International Space Station is due to fly over and let you tweet one of its astronauts. • Countdown timer for New Horizons mission to Pluto! See the latest pictures of this mysterious world and track the spacecraft's distance as it closes in. I love this app. It works really well. It's easy to use and it has many more features than you'd expect for the price: 1) night vision setting, 2) satellite tracking that highlights manmade objects traversing the night sky, 3) pop-up information windows that give history and context about objects you're interested in, and much more. Perhaps the best app I've bought to-date! The app notified me (pop up message) the space station was going to be in view in 3 mins. I opened the app, looked at the trajectory it would be in, went to the window that would have it in view, and watched it go by. It was a small light flying across the sky. This event alone was worth every penny. Can't wait to get my telescope out, next time!